Mangaluru, Mar 21, 2018: AICC President Rahul Gandhi is holding a meeting with Block Congress Presidents at Circuit House here on March 21, Wednesday. Block Congress Chiefs from both Dakshina Kannada and Udupi districts are attending the meeting. 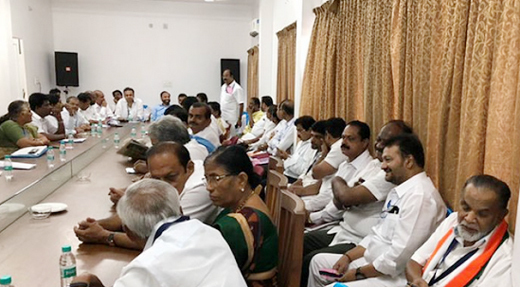 Chief Minister Siddaramaiah, KPCC President G Parameshwar, AICC General Secretary and in-charge of party affairs in Karnataka K C Venugopal too are participating in the meeting apart from all party MLAs of the district. Security in the Circuit House and its vicinity has been tightened in view of the meeting.